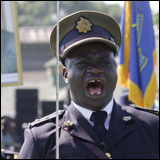 The Zimbabwe Republic Police (or ZRP) is the national police force of Zimbabwe, known until July 1980 as the British South Africa Police. The force consists of at least 39,000 officers and is headquartered in Harare at the Police general Headquarters(PGHQ). The force is organised by province, and comprises uniformed national police, the Criminal Investigation Department, and traffic police. To date, there are 17 known provinces which are headed by a Senior assistant Commissioner. It also includes specialist support units including the (paramilitary) Police Support Unit and riot police, a Police Internal Security and Intelligence unit (the equivalent of the Rhodesian Special Branch); and ceremonial and canine units. 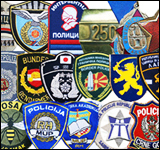 The predecessor of the Zimbabwe Republic Police was the British South Africa Police of Rhodesia and the interim state of Zimbabwe Rhodesia. Following independence in 1980, the force had a strength of about 9,000 regular personnel and a further 25,000 police reservists (nearly half of whom were white Zimbabweans of European ancestry). After independence, the force followed an official policy of "Africanisation", in which senior white officers were retired, and their positions filled by black officers. In 1982, Wiridzayi Nguruve, who had joined the force as a Constable in 1960, became the first black commissioner of the force. He was then succeeded by Henry Mkurazhizha.